Cloudy apple juice is better for you than clear varieties, say researchers. Polish scientists found the levels of antioxidants which protect against heart disease and cancer are almost double in cloudy apple juice. The antioxidants, called polyphenols, are also found in red wine, berries and dark chocolate. In the Journal of the Science of Food and Agriculture, the researchers said the manufacturing process led to fewer polyphenols in clear apple juice. The researchers at the Agricultural University of Wroclaw measured the amount of procyanidins, the main compounds containing polyphenols in apples, in two varieties of clear and cloudy apple juices. They also measured the antioxidant activity in the four juices. Juice made from the Champion variety of apples was found to have higher levels of polyphenols than juice made from Idared apples. But overall cloudy apple juice, which contains more pulp, was found to have higher concentrations of antioxidants and showed more antioxidant activity in experiments. There was a four-fold difference in polyphenols between the best and worst juices. Study leader, Dr Jan Oszmianski, said they had found they same results for clear and pureed or cloudy strawberry juices. "I recommend cloudy juices as they contain more polyphenols and pectins. "Health benefits are expected mainly in the case of cloudy apple juice consumption." Previous research has shown that polyphenols contained in fruit and vegetables help to protect against diseases such as cancer, by mopping up free radicals which can cause damage to cells. Apples themselves contain a wide variety of polyphenols but when processed into apple juice some of these may be lost. The manufacturing process used to make clear apple juice, which include using an enzyme to break down the pectin in apple cell walls and spinning to remove pulp, considerably decreases the levels of polyphenols in the end product, Dr Oszmianski explained. Dr Paul Kroon, senior research scientist at the Institute of Food Research in Norwich said clear apple juices tended to be more popular and are more stable giving them a longer shelf life. "A lot of polyphenols are lost when you make a clear juice. It could also be that because you're retaining that cloudiness and pectin there's the additional benefit of fibre. "If you're interested in health, you should go for a non-clarified apple juice." Dr Kroon said eating an apple would be better than drinking apple juice, although farmers had been growing sweeter less astringent varieties with fewer polyphenols. 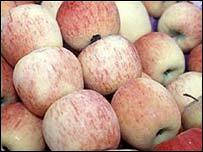 "Before we knew about the them, polyphenols were bred out of apples and now we're looking at putting them back," he said. Judy Moore, spokesperson for the British Dietetic Association and registered dietitian said: "Almost doubling your intake of apple polyphenols by switching from clear to cloudy juice seems an easy option for apple juice drinkers. "Don't forget that eating apples offers more health benefits than drinking apple juice as you also get the fibre in apples."